how the PPB will interact with the FBI in the future. sent a letter urging council to take action. Read about the FBI's bizarre December 4 news conference where they admitted they deport people on immigration issues if they can't find criminal evidence. Also, on January 9, the Oregonian posted an uncritical piece stating how the PJTTF helped Mayor Wheeler investigate a death threat coupled with extortion (which isn't terrorism), in what seems to be part of a public relations blitz after Commissioner Jo Ann Hardesty's election and her promise to pull out of the JTTF. In November, the FBI posted a long list of Portland JTTF incidents trying to prove their value to the community, but most are about individuals committing crimes, not organized "terrorism." "Why Portland Should Get Back Out of the Terrorism Task Force"
Also watch this clip from 2001 about the JTTF including testimony at City Council and community voices such as Jo Ann Bowman (now Hardesty). 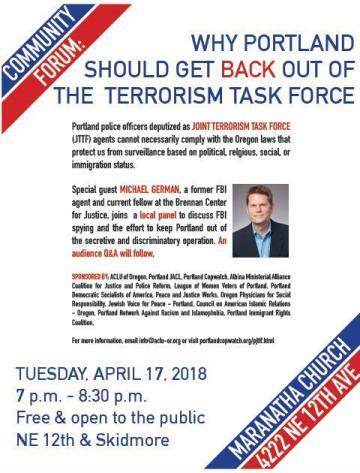 On November 8, 2017, a letter then signed by 23 organizations (now 49) and a prominent Portland area survivor of unwarranted spying was presented to Portland City Council asking to get the Portland Police out of the Joint Terrorism Task Force (JTTF). Since the late 1990s, Portland Police have been working with the JTTF, an FBI-led coalition of law enforcement which includes Immigration and Customs Enforcement, the IRS, Homeland Security and local police agencies. The FBI and partner agencies have been targeting Muslims, immigrants, the Black Lives Matter movement and other activists . --Between 2000-2004, Portlanders organized to get the PPB to remove its two full-time officers from of the Joint Terrorism Task Force, succeeding in 2005. Between 2011 and 2015, the PPB semi-rejoined the JTTF, only assigning officers to work with the FBI part time, and requiring annual reports which were extremely vague about the JTTF's activities. In 2015, the PPB re-assigned two members full time after a 3-2 Council vote led by then-Mayor Charlie Hales. As of 2017, the PPB officers are only assigned part time. --Times have changed and there is reason to believe the targeting of people for their First Amendment activities will only ramp up. --We need you to contact City Council today and tell them to get the Portland Police out of the Joint Terrorism Task Force. • Follow the list of links to more information. Note: In 2005, the Multnomah County Sheriff joined the JTTF, it's not clear why they are not mentioned in this list. If you email Council directly, please feel free to bcc: a copy to so we can get a sense of how many people are contacting Council. On April 28, 2005, Portland City Council voted 4-1 to withdraw its two police officers from the Portland Joint Terrorism Task Force (PJTTF). The resolution requiring the withdrawal allows 90 days for the officers to stop going to work every day at the FBI building, but rather to come back to work for the Portland Police Bureau's Criminal Intelligence Unit (CIU). Despite criticism from the mainstream media, the Portland Police Association, the Citizens Crime Commission, Commissioner Dan Saltzman, Senator Gordon Smith, and others, the resolution explicitly calls for the Portland Police to work cooperatively with the FBI. As has been encouraged for many years by many of the organizations testifying to City Council about the PJTTF, it is possible for Portland to help the FBI with legitimate criminal investigations of those who are using violence to blow up and otherwise harm people for political (or any other!) reason without giving up oversight of what those officers are doing. --The two officers will retain their "Top Secret" clearance for use during a "critical incident or imminent terrorist threat." --The FBI can request the officers assist in any "Secret" level investigation subject to review and withdrawal by the Chief and the Mayor. --Mayor Potter (the Police Commissioner) will not be allowed to sit in on the PJTTF Executive Group, but Chief Foxworth will be able to, and after Potter has "Secret" clearance Foxworth can brief the Mayor on those meetings. So for all the fearmongering that the sky is falling and the City snubbed the feds, those who have expressed concerns about the FBI's past and current record of spying on people for their political, religious or social affiliations have more to worry about than those who think Al Qaeda is sleeping under every child's bed. --The FBI and the US Attorney admitted it is not their job to ensure Portland officers are following Oregon law. But this is all the more reason for us to continue to demand transparency and public reporting on the activities of the CIU and the PJTTF. We recommended that the Mayor add an annual review to report how often the officers are asked to join the FBI and whether the new agreement is working. He said he would consider doing that, if the FBI agrees to participate. At the April 28 hearing, Mayor Potter emphasized the point that, in fact, is why Portland Copwatch is a project of a peace group: That in this country, we have the President, a civilian, to oversee the military, and so we must have civilian oversight of law enforcement on a local level. He admitted that prior to becoming a police officer, he shared the fear expressed by one Arab-American man whenever he saw a police car in his rear view mirror. He said that the community should be assured that officers are there to protect them, not to harm them. He expressed confidence that the resolution was the correct decision to make, shrugging off a suggestion from a reporter who told him that if anyone were to attack Portland, he would be "toast." He joked, "I suppose that depends how close to it I am." Again, he emphasized that he had built a working relationship with the FBI and the US Attorney, perhaps a better relationship than existed when the officers were left to work for the FBI unsupervised. By taking this proactive step now, Portland is perhaps stemming the tide of post-9/11 hysteria and avoiding what will likely be the subject of reparations and apologies some 40 years down the line. Background information from prior to this new resolution is included elsewhere on this site. Read information on a case of Portland Police spying on our parent group, Peace and Justice Works, which was rejected by the US 9th Circuit Court on March 2, 2005. Read the City Council Candidate Questionnaire for the May 15, 2018 election including answers from 7 of 10 candidates running for two seats.